Entries from Digital Intelligence tagged with "orkut"
Google's first social networking site Orkut will shut down after September, a decade on from its launch, as the internet giant looks to focus on its YouTube, Blogger and Google+ networks instead. This chart shows the active users for the top 10 social networks by region. Respondents were asked the question "Which of the following services have you used/contributed to in the last month?". Facebook proved to be popular across all regions, with 55% of North American users posting or contributing every month. Interestingly Middle East and African respodents posted to professional social network Linkedln more than any other region (18%). 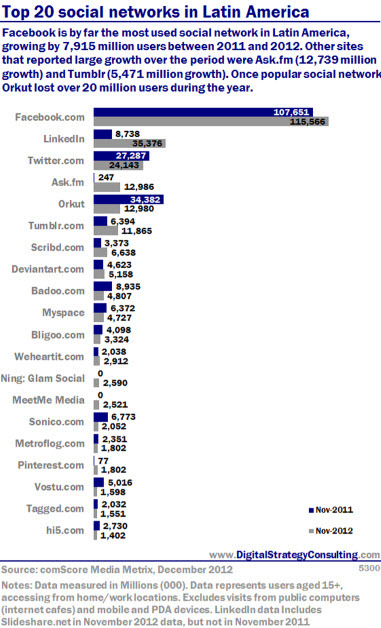 This chart shows the top 24 social networks by global monthly active users. Facebook leads with almost 1.2 billion monthly users. 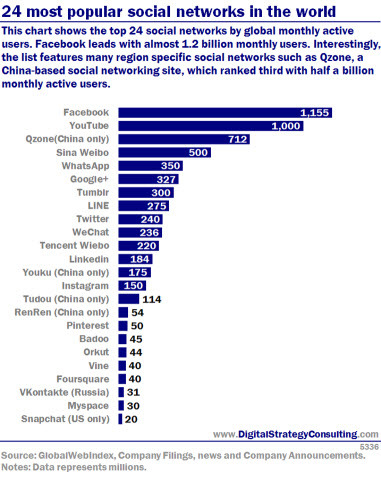 Interestingly, the list features many region specific social networks such as Qzone, a China-based social networking site, which ranked third with half a billion monthly active users. Facebook and YouTube are the most popular social networks in the world, followed by China’s Qzone and Sina Weibo, according to a new report. 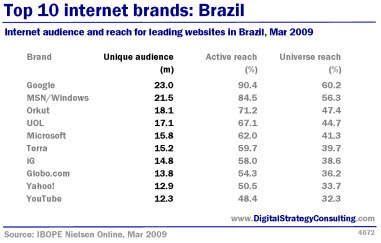 Facebook is by far the most used social network in Latin America, growing by 7,915 million users between 2011 and 2012. Other sites that reported large growth over the period were Ask.fm (12,739 million growth) and Tumblr (5,471 million growth). Once popular social network Orkut lost over 20 million users during the year. As more people connect to the Internet in India, time spent social networking is exploding on sites like Facebook and Orkut. It's one of the primary motivations for going online. In both rural and urban areas, social networking is a key driver of use. The most popular site in India is now Facebook, which has seen its market share grow by almost 50% from 2010 and 2011. This article looks at five key social networks in India. Facebook has reached the top spot in the Brazilian social networking market following a year of exceptional growth, according to new research. The study from comScore shows that in December 2011, Facebook.com attracted 36.1 million visitors – representing an increase of 192 percent in the past twelve months – to surpass Orkut as the leading social networking destination in the market. Social media is booming in India, with Facebook and Yahoo leading the way, according to new data. The study, from Burson – Marsteller, indicates that Facebook and Yahoo are the top two sites in India with nearly 52% reach. The findings indicate that social media is the online destination of choice in India, ahead of news and sports sites.